After the Detroit Tigers delivered a lesson in sequencing last night, producing their first in-game lead and first win since trading Justin Verlander and Justin Upton last week (indeed, since JV’s last start for Detroit), Verlander made his first major-league appearance in a non-Tigers uniform when he took the mound for the Astros in Seattle. The idea that Houston would be in the hunt this year is not a terribly surprising one. They were in the playoffs in 2015, missed the postseason in 2016 despite winning eighty-four games, and responded this year by opening up a massive lead in their division they’ve never relinquished. Three years ago, though, when Sports Illustrated declared them the (eventual) winner of the 2017 Word Series, things were different. They won just seventy games that year, fifty-one the year before, and fifty-five in 2012, their first season under highly regarded General Manager Jeff Luhnow. That 2015 playoff berth was the team’s first since 2005, when they represented the National League in a losing World Series effort against the White Sox. I remember the day I saw that SI cover, probably the magazine’s most memorable in some years. At that time, I didn’t think the prediction was outlandish, having been clued into the significance of the Luhnow hire two years prior and aware of the widely noted Chicago Cubs’ contemporary rebuild under Theo Epstein. 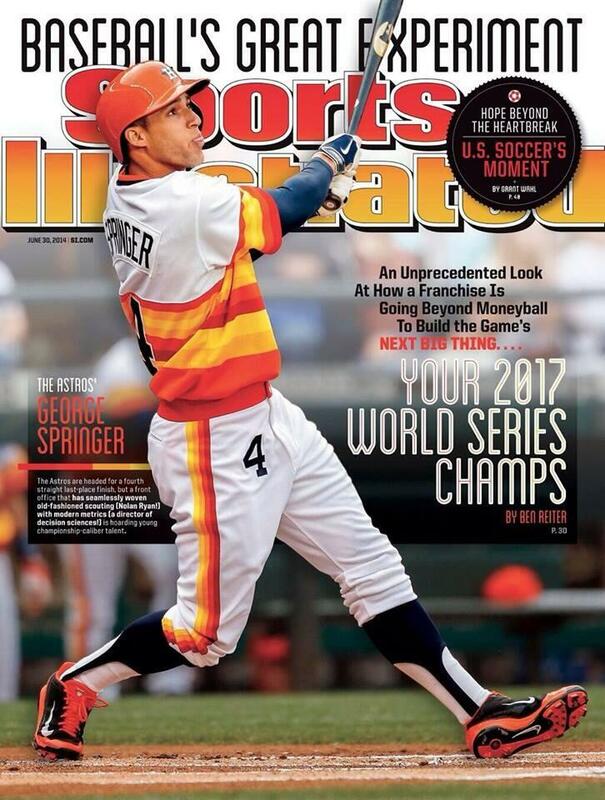 What I also didn’t think at that time, though, was that the Astros’ championship plan might include the acquisition of a veteran star from the team I follow. From Houston’s perspective, the trade makes perfect sense; somehow, though, I never considered I’d be watching them make their run with a player as familiar as Verlander. I’m still scratching my head too. With a 13.5-game lead in the AL West in September, Houston is an obvious lock for the playoffs, as those odds cited above indicate. Naturally, their odds to win the World Series also are strong (15.5% (BP); 21.5% (FG); 15% (538)): they’re the favorite according to FanGraphs, while BP and FiveThirtyEight place the Dodgers and Indians slightly higher. To my knowledge, none of these projection systems really account for the addition of Verlander, however (though, as some have pointed out, both the Astros and Verlander have struggled against Cleveland in recent meetings). Whatever Verlander’s statistical impact on his new team’s championship chances, I know he’ll be a compelling watch in the postseason, even if it looks like he’s wearing a Halloween costume.